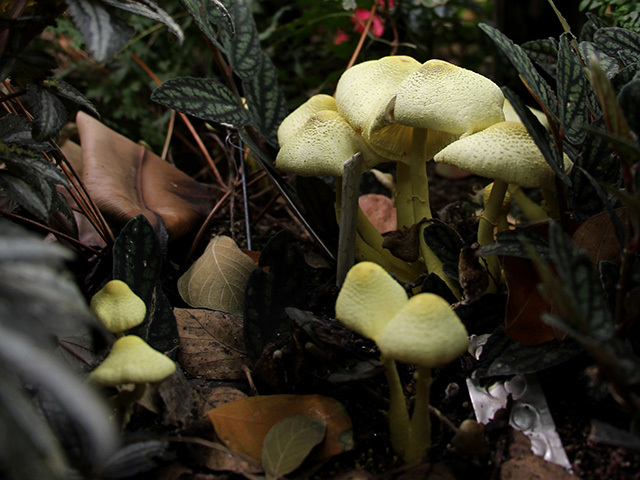 This handsome yellow mushroom pops up frequently in greenhouses and potted plants. Its saprobic mycelium lives in the soil, digesting organic matter. The actions of its enzymes help break down soil and mulch, making mineral nutrients more accessible to plant roots. Thus it does not harm nearby plants, and in our opinion it sometimes outshines them. 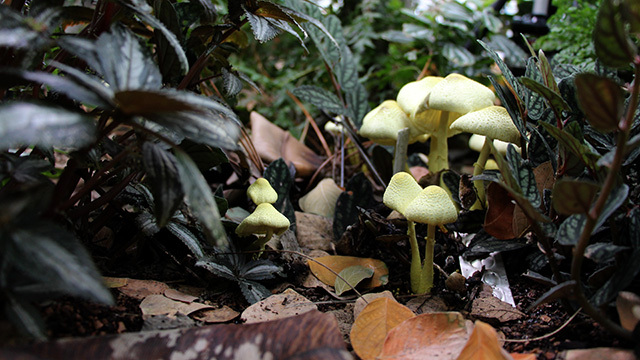 The yellow mushrooms pop up when conditions are right. They produce spores that help the fungus spread. These mushrooms are not dangerous to touch or smell, but cause stomach upset if eaten. Horticultural notes: This mushroom is believed to be native to the tropics. It is probably introduced to greenhouses in potting soil. These popped up in the yard over the weekend. Fred’s there just for scale. (He was curious why I was down on the ground.) I shooed him off and destroyed these right after this shot. 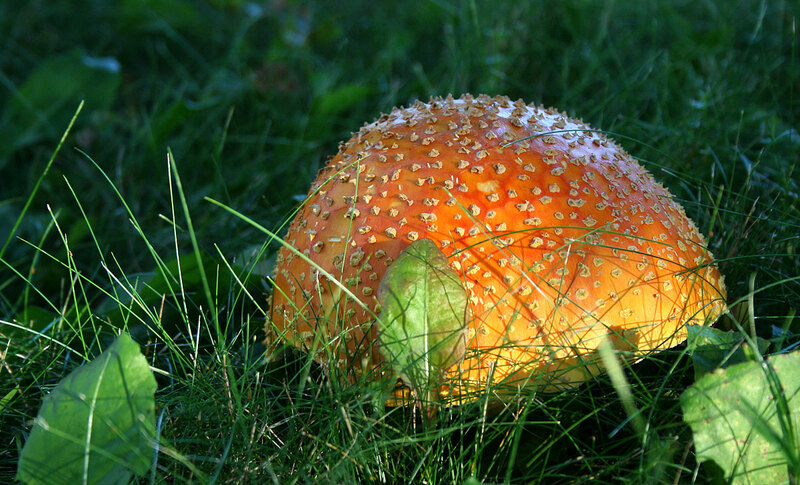 Author CraigPosted on September 23, 2009 Categories Fungi5 Comments on An amanita? Update [2/10/2008]: Nice article in the Cornell Chronicle this week featuring a picture of Kent at work with his borescope. On the way home from work today, I stopped by the new gallery in Mann Library for the opening of Miniature Landscapes, an extraordinary exhibit by Kent Loeffler, one of three photographers who have served the Department of Plant Pathology at Cornell over the last century, and Kathie Hodge, a faculty member in that department who blogs at the Cornell Mushroom Blog. Kent is a treasure and one of the nicest guys you’ll ever meet. He toils all day shooting diseased leaves and other mundane subjects. But he’s a great artist and photographer who is as quick to share his expertise as he is to share his smile. If you’re in the neighborhood, you owe it to yourself to view these photos. Kent used a borescope to get right down into the the world of fungi. He describes it as “a bit like having a fisheye lens on the end of a stick.” You can see more examples of this technique and some of the technical details at his photo lab website. Kathie’s equally fascinating videos of growing fungi and decaying fruit are running on continuous loops on retro Macs in the center of the exhibit. Some of my favorite work of Kent’s, though, are at the other end of the spectrum — his panoramas. (You can drag yourself around Minns Garden outside my office 360 degrees.) Many have graced the cornell.edu homepage and some 6-foot-long prints of his decorate the halls of the office where my wife works in Collegetown. Plant Pathology Photos rescued from the old ExploreCornell site. Interesting historical stuff along with Kent’s work. Ithaca 360 features more of Kent’s 360-degree panoramas from the Ithaca area. Interesting note: If you google image search Kent’s name, you don’t get his great art. 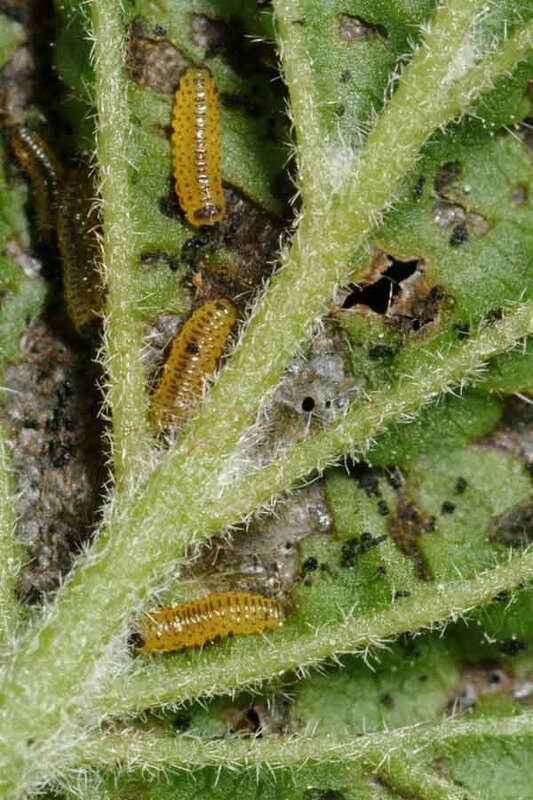 But you do get a great image we comissioned Kent to do of viburnum leaf beetle larva for our viburnum leaf beetle website. NowÂ whatÂ excuseÂ canÂ IÂ thinkÂ upÂ toÂ borrowÂ Kent’sÂ borescope? We used to have an old, very bizzare Christmas decoration that we inherited from somewhere on my wife’s side of the family. It was made from some kind of early synthetic rubber material, and had Santa riding in his sleigh landing on this huge red mushroom. I never really got it. We just thought it was weird. 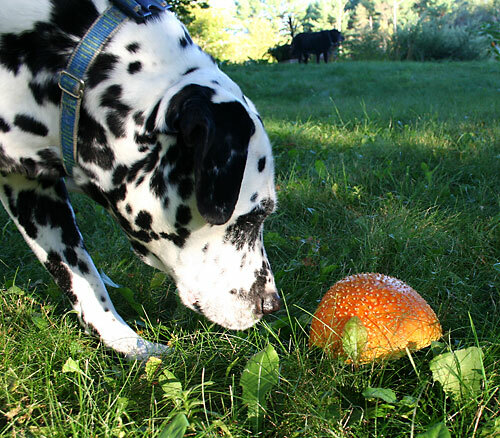 This morning I was listening to the podcast of yesterday’s Thom Hartmann radio show, and he related this story: Though he did not identify the mushroom by name, the fly agaric (Amanita muscaria) grows in association with evergreen trees in the boreal forest. It is both poisonous and hallucinogenic. But apparently reindeer can metabolize the toxin and excrete the hallucinogen unscathed. 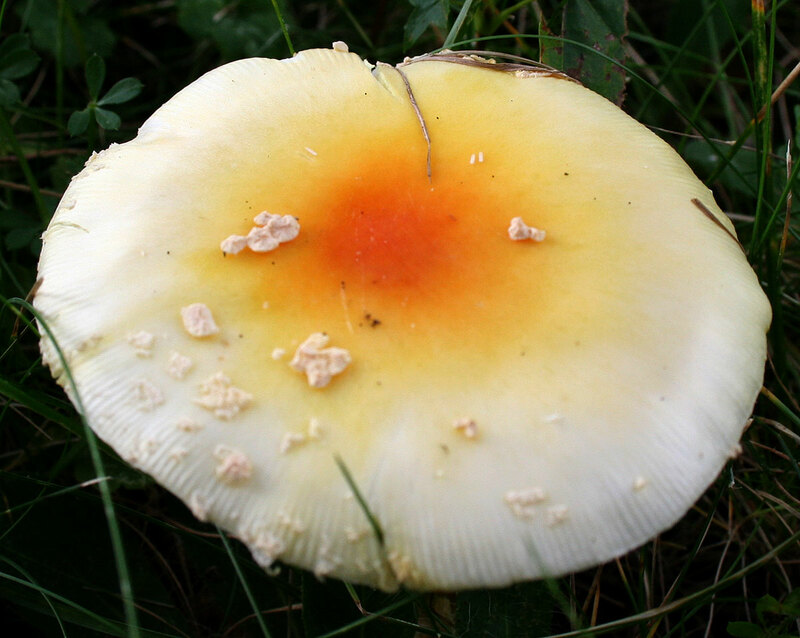 So Norse shamans would cultivate the mushrooms, encourage the reindeer to eat them, gather up the yellow snow and make a psychoactive brew. And you wondered where the jolly man in the red suit, flying reindeer and elves from the North Pole got their start. 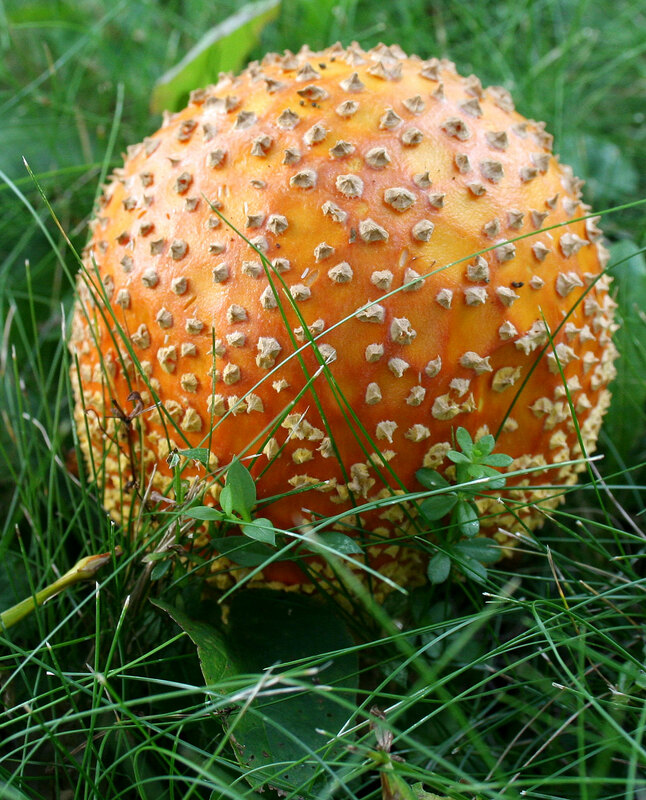 Â I think we should thank the Amanita. Hartmann’s story differs from the Wikipedia entry, which has the reindeer prancing from the effects of the agaric. But it still makes the connection between Amanita and Christmas traditions.